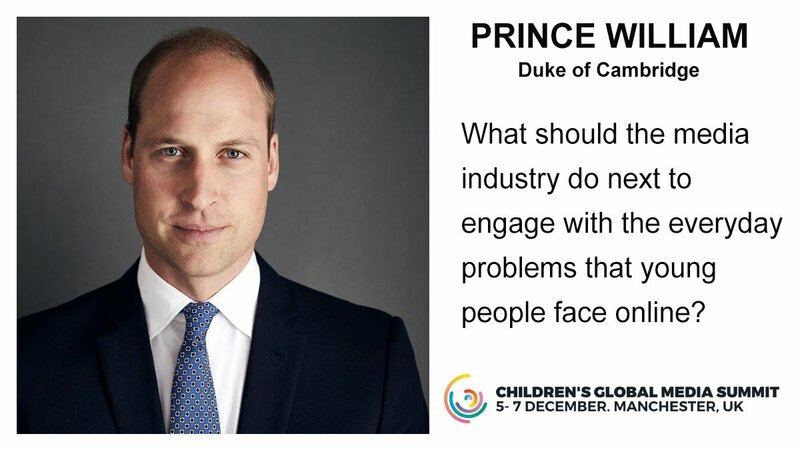 PRINCE William will deliver a keynote speech on children’s mental health at the Children’s Global Media Summit in Manchester on Wednesday 6 December. The three-day summit which takes place from Tuesday 5 December – Thursday 7 December at Manchester Central, will bring together creatives, technology innovators, policymakers, executives and thought leaders from around the globe to inform and redesign the future of media and explore the impact that digital technology will have in children’s futures. Sessions and keynotes will focus on five key themes: Innovation, Empowerment, Freedom, Entertainment and Education. Speakers at the event include; Rizzle Kicks, Jordan Stevens, Musician, vlogger and author Tom Fletcher and YouTube star Oli White. The Summit began in 1995 and aims to help secure the future of children’s programming in a rapidly-changing world. It is held every three years, and was previously hosted in Australia, London and Kuala Lumpur. The content of the 2017 Manchester hosted event is being curated by the BBC who are working with a group of broadcast partners, academic institutions and policymakers to create a rich and unique programme of content which reflects the world of media through the eyes of a young global audience.